The Early Years Foundation Stage (EYFS) is mandatory for all schools in Ofsted registered settings attended by young children i.e. from birth to the end of the academic year in which a child has their fifth birthday. Each of the principles is supported by four commitments. Our long term plan at St Weonards outlines how we put the principles and commitments of the EYFS into practice in our setting and is used alongside policies and procedures that underpin statutory welfare requirements. What to expect, when? A parents guide. Every child is a competent learner from birth who can be resilient, capable, confident and self-assured. Child Development: Babies and children develop in individual ways and at varying rates. Every area of development – physical, cognitive, linguistic, spiritual, social and emotional – is equally important. Inclusive Practice: The diversity of individuals and communities is valued. No child or family is discriminated against. Keeping Safe: Young children are vulnerable. They develop resilience when their physical and psychological well-being is protected by adults. Health and Well-being: Children’s health is an integral part of their emotional, mental, social, environmental and spiritual well-being and is supported by attention to these aspects. At St Weonards we support each Unique Child by recognising and respecting children’s individual characteristics and temperament. We get to know each child really well through sensitive observations of their freely chosen play; by listening to them and their parents/ carers and by interacting in their play. As a result we are able to tune into their interests, schemas, communication and learning styles. By providing time, space and resources for child-initiated play, we enable children to explore, investigate, and demonstrate their knowledge, skills and attitudes. We ensure children feel valued, secure and confident to learn by acknowledging them as competent learners and building on what they can already do and understand. Children’s communication skills are supported through high quality adult/ child interactions where we provide good eye contact, follow the child’s lead, tune into their focus of interest and have genuine conversations with children. We praise and affirm their communication, commenting on what they are doing or the focus of their attention and take opportunities to explain, repeat and expand vocabulary. By working in partnership with parents and other agencies, and by providing an accessible and welcoming environment, we aim to include all children effectively. We use a visual timetable so that all children can feel secure in the knowledge of what will be happening throughout the day and can track the sequential progress of the day’s events. We provide additional support for children’s developing speech and language skills by using photographs, symbols and gestures. We provide warm, responsive care and have an effective safeguarding policy and procedure. As a Healthy Eating School we respect and support children’s dietary and medical needs, provide a range of healthy fruit and promote the benefits of drinking water. Children get fresh air and exercise in our outdoor areas. We provide a safe, secure environment both indoors and outdoors where children can pursue enjoyable and challenging activities with a balance of physically active and restful activities. We explain and demonstrate clear, consistent boundaries and routines and help children to learn to assess risks and keep safe. At St Weonards we provide Positive Relationships by working as a close co-operative staff team and in partnership with parents, to support every child in our care. We make time to form good relationships with children and their families, initially by making home visits and then through sensitive induction into our setting. We communicate with practitioners from previous settings to help make transitions smooth and seamless for children and families. In our Nursery parents are welcome to stay with children until they are settled at the beginning of each day, giving time for informal dialogue between parents and staff. Information for parents is displayed on our notice boards and we also have a regular newsletter describing our recent activities. Parents are valued contributors to their child’s individual Learning Journey and there is a two-way flow of information about children’s progress. This is done through Communication Diaries in Reception and events and feedback such as Parents’ Evening, Reports, and Open Mornings. Parents are helped to understand more about learning and teaching through involvement in regular Family Learning sessions and meetings on early reading in Reception classes. Teaching staff, including teaching assistants and nursery nurses, get to know the children really well, respond sensitively to their feelings, ideas and behaviour and help them become settled, secure and confident. We help children understand their own feelings and those of others, and support them in building friendships. Stories, Circle Time, Persona dolls and puppets are used to promote understanding and respect for different needs, views and cultures. By valuing their contributions, tuning into their interests and needs, encouraging and praising their achievements, we nurture children’s self-esteem and give them a strong sense of belonging. We use friendly and lively approaches to stimulate and support children, encouraging them to try several ways to make something work rather than giving up. In order to support children’s development and learning effectively, we make sensitive observations of children and then respond and interact appropriately. Because we know the children well we are able to judge when children are ready to be taught new concepts and skills. By joining in the children’s play, we show that we respect and value the children’s ideas and creativity; through exploring materials and researching alongside the children we encourage and extend curiosity, language development and thinking skills. By modelling how to be a learner, we help children reflect on their own learning. We provide an enriching environment both inside and outside, where there is free flow between the two areas as much as possible. 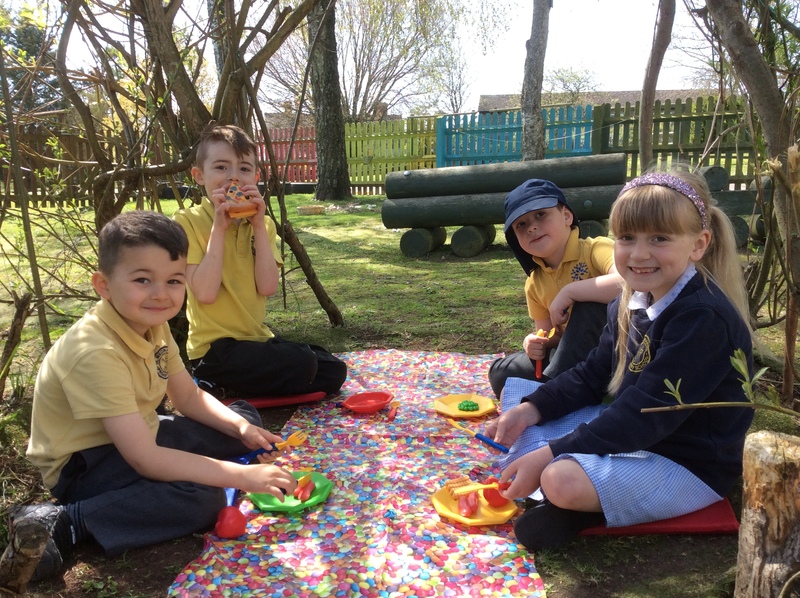 To enable children to experience the weather and the seasons first hand we are building up stimulating resources such as our Windy Weather boxes of windmills, streamers, kites and bubbles and our recently developed Outdoor Classroom. Being outside has a positive impact on children’s sense of well-being and our outdoor environment is resourced to support all seven areas of learning and development. For example, children have opportunities to explore and investigate the natural world and a range of sights, smells, sounds and textures; they can plant flowers and vegetables; pond dip and search for minibeasts; follow maths trails; use maps for treasure hunts; control programmable toys; do large scale painting with decorators’ brushes; create music and dance; co-operate in parachute games; engage in action rhymes and traditional playground games; and enjoy role play that requires extra space such as fire fighting or postal delivery. We also provide quiet relaxing spaces like our gazebo, our numerous benches and tables, our storytellers chair and shady areas under the trees for children to have space and time to watch, talk, reflect, draw, and enjoy stories. Our inside environment also supports all areas of learning and development. Where space allows resources are accessible for children and are stored in such a way that they can easily find them and know where to put them away. For example, storage boxes and drawers are not only labelled with words but also with photographs and pictures of the contents. Where possible, resources are stored in transparent containers. We provide children with a range of multi-sensory experiences and open-ended resources to encourage exploration, investigation and creativity and to generally enrich their learning and development. We have a sensory tray where, early writing can be explored by mark-making in custard, cornflour silk, soapy sand or finger paints. Exploring playdough and clay is not only a satisfying sensory and therapeutic experience, but it also helps develops children’s manipulative skills. Water play and trays of material like sand, compost, lentils or linseed, give children opportunities to explore filling containers and investigate different sizes, shapes and capacity. Over the weeks we may add a range of other stimuli to the water tray, including: food colouring; ice cubes; small world sea creatures; sailing boats; bubbles; plastic tubing; and water wheels. In the sand or compost, children are able to dig for buried treasure, which might include objects of different texture, colours shape or size; or letters, words or numbers. Our children use all their senses to explore and investigate Treasure Baskets/Containers of objects with a range of textures. 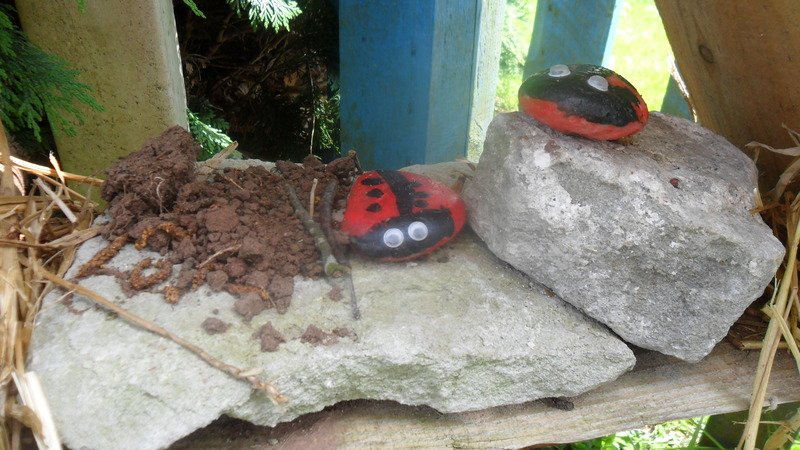 Interactive displays encourage the children to explore a range of natural and man-made resources independently. These may include: shells; pebbles; fir cones; conkers; magnets; magnifying glasses; prisms; colour filters; torches; mirrors; kaleidoscopes; locks and keys; cogs and wheels. We have a comfortable, attractive book corner where children can independently access and enjoy a range of picture books, stories, poems and non-fiction. These include books that: encourage interaction such as flap books and pop-up books; reflect cultural diversity and additional needs through positive images; support children who are experiencing a variety of life events e.g. new sibling, admission into hospital; have been written by the children with the practitioners; and have photos of recent events in the setting with appropriate captions. There are soft toys for children to cuddle and read stories to, Story Sacks and puppets for them to engage in retelling stories, and a cassette recorder for children to listen to taped stories and rhymes. We resource our environment to give children scope for developing their imagination and begin to create stories through: small world play (dolls house; farm set; vehicles and play mat; garage; castle; play people; railway track; cars, dinosaurs etc. 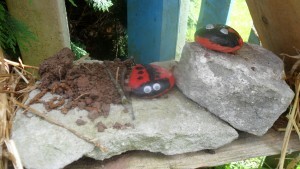 ); by providing resources for extending sand play (shells; pebbles; twigs; play people; lego bricks; diggers; cars; trucks; dinosaurs; large black tray) so children can create gardens, parks, building sites, castles, treasure islands or other imaginative scenarios. Writing boxes are available for children to add labels and captions to their work and musical instruments for them to add sound effects. Fiction and non-fiction books form part of this environment, frequently being changed to maintain the child’s interest and to foster a love of books. The children help us to plan and resource our role play area and we ensure that it not only supports children’s creative development but also provides rich and meaningful opportunities for other areas of learning. For example, if the children have decided they would like a Café this gives us opportunities for developing Communication Language and Literacy by providing a menu; an order pad; recipes; bills; receipts; posters; a “Specials” blackboard; signs such as “Open”, “Closed” and “Pay here”. There are also ideal opportunities for developing Mathematics through the number of items being ordered, the use of mathematical language such as “one more”, “the biggest cake”, “the round biscuit”, and payment of the bill. 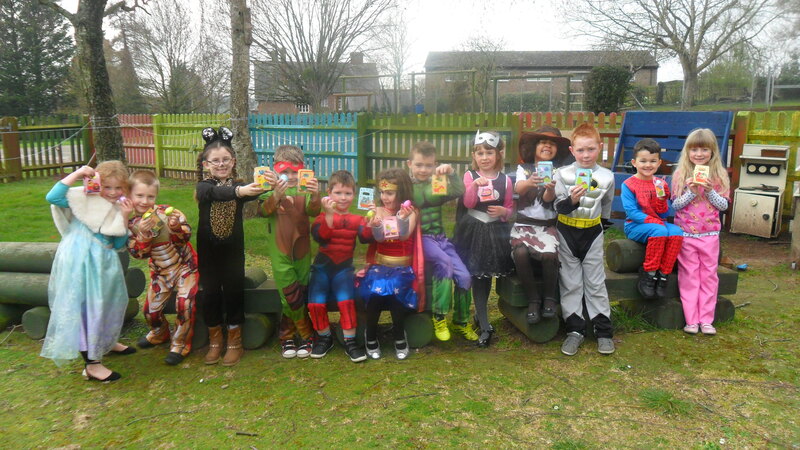 In order to give children greater scope for creative play we also provide lengths of fabric for dressing up and other open-ended resources which the children can adapt and use imaginatively. We have an inviting Writing table/area to encourage independent writing, with a range of attractive resources including: paper and card of different sizes, colours and shapes; pencils, crayons, felt tips; clipboards; postcards; envelopes; scissors; sticky tape; glue sticks; paper clips; hole punch; treasury tags/string; note books; message pads; telephone directories; old diaries and address books; blank coupons and forms to fill in. We provide a range of stimuli that is selected to reflect and extend the children’s current interests such as: greetings cards; postcards; party invitations; letters and addressed envelopes; leaflets; flap books; zig zag books; pop-up books; books such as “The Jolly Postman”. We provide Creative materials for “placing and arranging”, such as shells, leaves, pebbles, feathers, buttons and seeds. To support “designing and making”, we provide empty boxes, cardboard tubes, lolly sticks, paper and card, scissors, masking tape, glue, hole punch etc. We also use a range of kits such as duplo, Lego, mobilo, constructo-straw, magnetic blocks, stickle bricks and luna park to support construction play. In addition we display photos of buildings, bridges and vehicles to inspire children with their constructions, and provide clipboards and pencils for them to record their ideas. At the appropriate stage, children are encouraged to take photographs with the digital camera and to write captions; draw and label diagrams of their models; and even write instructions on how to build them. Children have lots of opportunities to develop their mathematical skills in both the indoor and outdoor environment. As much as possible we use real life situations to make mathematics meaningful, for example: celebrating birthdays; preparing for snack time; writing shopping lists; cooking; planning for a party; scoring for games. The children also enjoy going on Maths trails to look for different shapes and numbers, counting the “giant strides” or “kangaroo jumps” they make as they search. Treasure hunts and obstacle courses support children with their positional language as they look under, on top of, next to, behind, and travel through, round and over. Target games outside are very popular, when children throw bean bags onto a chalked number grid or count up the score as they successfully throw beanbags into a bucket. We have some interesting collections of objects for children to sort, classify, order and count, such as: shells, pebbles, buttons and beads. The children help us to order numbers on a washing and make human number lines. Parents have helped us collect props to support the many number rhymes that the children enjoy, such as: Five Little Speckled Frogs; Five Little Ducks; Ten Green Bottles; Ten Little Monkeys jumping on the bed. At St Weonards we acknowledge and value children’s play and exploration as a powerful way in which they develop and learn, so we ensure a balance of adult-led and child-initiated activities. In order to promote children’s choice, exploration and independent learning, we ensure that the environment is accessible with a wide range of interesting, inviting opportunities. Through flexible planning we allow children time for sustained involvement in self-chosen activities and our high quality interactions facilitate and extend children’s creativity and critical thinking. Our cross-curricular planning, informed by children’s interests and needs, ensures all seven areas of learning and development are treated with equal importance and helps children make links in their learning. By building caring attachments with children and establishing an atmosphere in which achievement is valued, we nurture children’s self-esteem and positive dispositions to learn. These include curiosity; interest and excitement; exploration and investigation; sustained involvement; perseverance; resilience and critical thinking. We promote children’s independence by making them feel secure, having an accessible environment and familiar routines. They are encouraged to put their independence to good use by organising their own belongings at the beginning and the end of the day, making choices, and selecting their own resources when appropriate. We model good behaviour and respectful attitudes and support children in forming friendships, giving them opportunities to play in groups of various sizes. By using Puppets, Circle Time and stories to evoke discussion about feelings, we help children understand their own feelings and those of other people. We use Values Education to support children in understanding important values such as respect, patience, trust, and co-operation. Respect and empathy for difference is nurtured through the use of Persona dolls and stories that reflect positive images of cultural diversity and disability. We engage in high quality adult-child interactions to encourage, support and extend children’s speech and language development. St Weonards is an uncluttered “Communication Friendly Space” which creates a sense of calm and has small intimate spaces to encourage speaking and listening. We use the Teaching Talking programme to develop speaking and listening skills. Gestures are used to support all children to communicate effectively. We promote an ethos where listening to children’s ideas and feelings is important, where books are treated with respect and excited anticipation, and where children’s attempts at mark making and early writing are valued and encouraged. Children’s early reading is supported through enjoyable, fun activities from “Floppy’s Phonics” and we ensure that they have daily experience of action rhymes, songs and stories. We have a print rich environment with signs for children to read and an attractive book corner that houses a good range of stories, poetry and non-fiction books. Children are able to interact and recreate stories with props such as Story Sacks, puppets and story boards. We model the process of reading and writing for children. For example, when preparing for a cooking activity we read the recipe and write a shopping list together for the ingredients we need. 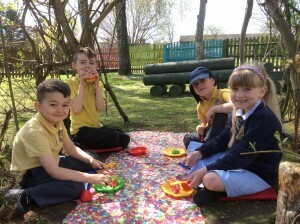 Swirling ribbons on sticks, painting with decorators’ brushes outside and stirring mixtures in cooking are amongst the activities to help develop children’s shoulder and arm movements for writing. Fine motor skills and hand-eye co-ordination are encouraged through such activities as finger rhymes, bead threading, pouring in the water tray and using tweezers to pick up small items. Opportunities for mark making are provided in the sensory tray with soapy sand, gloop and finger paints. The children can access a well-equipped writing table to encourage their emergent writing. We support the physical development of children with safe but challenging environments both indoors and outside, suited to the children’s stage of development. A balance of active and restful experiences is offered both inside and outside. Children have opportunities for energetic activities like throwing, rolling, kicking and catching games and developing their own vigorous play such as Superheroes. We help develop children’s spatial awareness by giving them opportunities to create pathways, negotiate obstacle courses and re-enact stories such as “We’re going on a Bear Hunt”. Children are helped to explore the different ways they can move such as jumping, marching, tip-toeing, rolling, and slithering. We provide time and opportunity for children with physical difficulties or motor impairments to develop their physical skills, working in partnership with relevant specialists such as physiotherapists and occupational therapist. We support children’s health and bodily awareness by: being aware of specific health difficulties such as allergies; helping children to enjoy their food and appreciate healthier choices by combining favourites with new tastes and textures; promoting the drinking of water; promoting the benefits of exercise; planning opportunities, particularly after exercise, for children to talk about how their bodies feel; encouraging good hygiene. Fine motor skills and hand-eye co-ordination are encouraged through giving children opportunities to use a range of tools and equipment such as: toys with push buttons, lift the flap books; playdough and clay; paintbrushes and rollers; jugs for pouring; cooking utensils; pegs and washing lines; musical instruments; small world toys; beads for threading; construction kits that fit together by pushing, twisting, slotting or magnetism. We capitalise on opportunities to count such as: counting the buttons on a child’s coat as we help them do them up; counting the number of children in the group and the number of pieces of fruit at snack time. Children sort, classify, order and count a range of items; lively number rhymes with supporting props help children with counting on and counting backwards; and we involve the children in making interesting number lines. As much as possible we use real life situations to make mathematics meaningful, for example when planning for a party: counting the number of invitations; thinking about quantities when writing the shopping list; weighing out ingredients when cooking the birthday cake; counting the number of candles; making party hats the right size; setting the table with the right number of place mats, plates, cups; wrapping different shape presents. Role play areas also help children to practise and consolidate skills in a meaningful context, for example when ordering a number of cakes in the café, paying for items in the shop, weighing the baby at the clinic, stacking the saucepans in the home corner, dialling numbers on the telephone, making appointments at the doctor’s surgery. 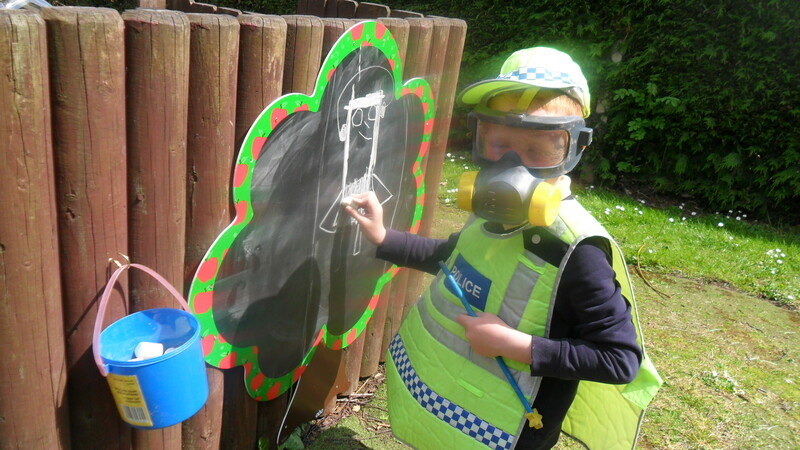 The children also enjoy going on Maths trails to search for numbers and shapes in the environment, for example numerals on doors, clocks, car registration plates, calendars; the number of windows, chimneys, trees, yellow flowers they can find etc. Treasure hunts support children with their positional language as they search for treasure under, on top of, next to, behind. They also construct obstacle courses and travel through, round and over. The children take part in and devise target number games outside, throwing bean bags onto a chalked number grid or counting up the score as they successfully throw beanbags into a bucket. To help their developing ideas of size we use stories such as Goldilocks and the Three Bears, The Three Billy Goats Gruff and Jack and the Beanstalk. We make good use of our indoor and outdoor environment and the local community to support children’s developing understanding of the world. To engage their curiosity and provoke “exploration and investigation” and “designing and making” skills we provide children with a range of multi-sensory experiences and open-ended resources as described in the section on “Enabling Environment”. We provide a range of equipment to support children’s interest and developing ability in using ICT; i.e. 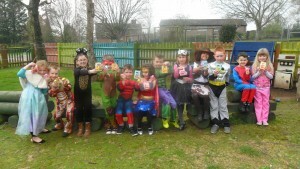 battery operated toys; torches; cassette recorder; portable CD player; digital camera; programmable toys; computers; and Interactive White Board (IWB) in all Reception classes. We teach children the skills to be able to use this equipment effectively and as independently as possible, for example knowing: which buttons they need to press to make the tape recorder stop, start and rewind; how to make the programmable toy go forwards, backwards and change direction; how to take a picture with the digital camera and view the photograph in the display screen; how to use the mouse on the computer. We support a sense of “Place” by talking about children’s favourite places, encouraging them to investigate different features of our outdoor area and local environment. Visits to the local church, park, woods, theatre and shops support this process. 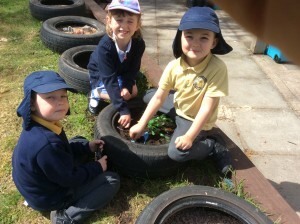 We encourage children to care for the environment by: involving them in growing plants and vegetables in our garden; by identifying features of the local environment that look uncared for or spoilt with litter, then discussing how we can improve it. By sharing photographs and picture books of different places such as cities, villages, the beach, mountains, deserts and jungles we introduce them to a range of different environments. We also provide play maps and small world equipment for children to create their own environments. During the summer term we do an extensive project on a chosen country, celebrating different cultures and lifestyles. To support learning about “Communities” our teddy bear, goes home with a different child from each class every week and the children are encouraged to talk and write about what the teddy bear has done whilst with them. People from the local community are invited to come and talk to us about their jobs and sometimes we are lucky enough to visit them, such as the local farmer, working on the farm. Children have opportunities to sample food from a variety of cultures, when we are celebrating different festivals and countries. We provide books and photos that show a range of dress and customs, ensuring that we use modern photographs, especially of parts of the world that are commonly stereotyped and misrepresented. We have letters and books in other languages, especially home languages of any children in our setting with EAL. In Circle Time we enable children to learn positive attitudes and behaviour towards people who are different from themselves through stories and puppets. We ensure that the ethos of St Weonards enables children to be creative by valuing their responses to experiences and the unique ways in which they express and communicate their ideas. We support their creativity and critical thinking across all seven areas of learning and development. Multi-sensory experiences are offered through many resources such as: soft feathers; silk squares; mirrors; shiny mobiles; smooth pebbles; bubbles; muslin bags containing herbs to smell; fragrant flowers; the beauty of the natural world. We observe and reflect on children’s responses and take opportunities to join in as co-explorers, supporting and extending children’s descriptive vocabulary of the colours, textures, smells and sounds they experience. Children are provided with a range of media and materials in which to respond and express their ideas, for example: gloop; playdough; clay; paint; crayons; pastels; chalks; charcoal; collage materials; strips of fabric and weaving frames; natural resources. We provide recorded music from a range of styles and cultures, giving children experiences of different instruments, moods and rhythms. Children are encouraged to explore a variety of percussion instruments and to create their own music to express their ideas and feelings or to respond to stories, poetry or art. They also have opportunities to paint whilst listening to music. CDs, musical instruments, scarves and streamers are available for children’s spontaneous responses to music through movement and dance. We encourage children to develop a repertoire of movements such as twisting, twirling, curling, and support them in identifying how they can perform these in different ways such as slowly, quickly, strongly, gently and by reaching up high or bending low. Children are encouraged to use their movements expressively to create their own dances. We also provide them with opportunities to see professional dancers, musicians, artists and storytellers. We facilitate children’s imaginative play by providing open-ended resources such as long lengths of fabric, which in the children’s hands might become cloaks, rivers or magic carpets and large empty boxes that could be houses, pirate ships, caves… We model different voices and expressive intonation as we read stories to inspire children to use different voices for characters in their imaginative play. Most importantly, we give children time to develop their play scenarios and become fully involved.